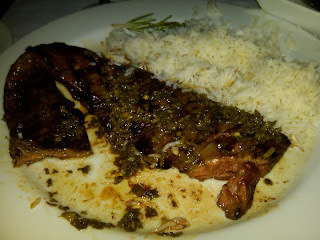 Gluten Free Beat ®: Want a Delicious Skirt Steak on South Beach?? Want a Delicious Skirt Steak on South Beach?? There's nothing like a great skirt steak. I'm in heaven thinking about it. 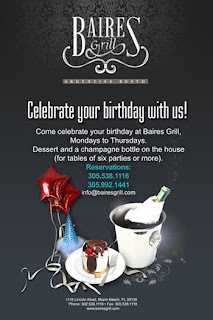 Baires Grill, a fabulous Argentinian Steak joint, on Lincoln Road (right next to the Lincoln Road movie theatre) puts it all together, oh so nicely. As you can see, I couldn't wait - after seeing this fabulous piece of meat, I showered chimichurri sauce all over it and went to town. I sprung for the 14 oz ($26) over the 10 oz ($21) (for a $5 difference, how could I go wrong?!). The plate was empty by the time I was done -- and the beauty of it all -- it's 100% GF!! I discussed my gluten issue with our server, she promised to keep my meat away from the grill that is used for breaded meat, and the rice is jasmine rice, safe as well. Baires also has an exciting birthday offer, bring 6 of your closest friends and share a bottle of champagne and dessert on Baires! A nice incentive for birthday celebrations! A HUGE THUMBS UP for Baires, I will be returning! THRIVE - It's New & 100% Raw, Vegan & GF! Go-Go Pies - GF Soup on South Beach! GF Pad Thai Wars - Who Does it Best? Chocolate Wafers - Sans Gluten! Pei Wei - P.F. 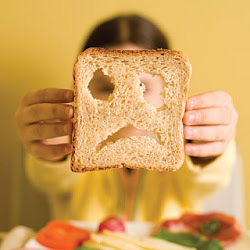 Changs Younger GF Child! Looking for GF in Islamorada? ?